Kamaole Sands is a beautiful 15-acre resort property located directly across from the popular Kamaole Beach park III and just a couple blocks away from Wailea. Some of the many conveniences and amenities featured at this resort include: Four Tennis courts, Swimming pool, Two jet spas, children's wading pool, eight gas BBQ grills, freshwater ponds and waterfalls, cyber cafe, exercize room and a 24-hour front desk and activity center. Accommodations include: A fully-equipped updated kitchen, washer/dryer, two cable TVs, DVD/blu-ray/CD player, telephone, free high speed internet, King size bed in Master bedroom, hair dryers, iron/board, NEW extremely quiet AIR CONDITIONING system in Both the LIVING ROOM and BEDROOM, and a private lanai. In addition to being across from one of the best beaches on the island, world-class golf, shopping, dining, and ocean activities are only a short walk or drive away. Easy walking distance to beaches, stores, restaurants and shopping. The condo is a ground floor end unit conveniently located adjacent to the BBQ area. We stayed in this condo for 8 nights and it was perfect for us (3 adults). It was very nice to have two bathrooms, and the sofa sleeper was surprisingly comfortable. Having a washer and dryer in the unit was very convenient, we packed lightly and did our laundry half-way through our trip. There is a closet with lots of fun "beach" items which included beach chairs, umbrellas, snorkel gear, towels, boogie boards, a cooler, and we added some re-usable blue ice blocks. The unit has an outdoor patio area. A short walk through the parking lot gets you to the pool and hot tubs. The complex is directly across the street from the beach, where we snorkeled with sea turtles :) The beach access also has a nice grassy area with shade trees. The complex is right off the Pi'ilani Hwy. If we ever make it back to Maui we would definitely stay here again. Everything we needed. We really appreciated the ”backpack” beach chairs, cooler, masks, fins, and snorkel's plus lots of extra ”accesories” available in the closet in the kitchen area... A beautiful area just to relax and enjoy! Great location, great property and wonderful owners. 6 stars! We stayed for 9 nights at Carey and Bob's condo. The location is excellent, right across the street from Kam III beach and easy to walk to restaurants. Our kids loved the pool area and games room. The grounds are beautiful and well kept. The condo itself was clean and comfortable for our family of 4. The master bedroom and living room both have quiet air conditioning, which we only needed at night. The bed in the master bedroom was super comfortable and we slept great every night. The only issue we had was with the hide-a-bed which had a broken leg. Carey and Bob responded to our concern within a day and were easy to get a hold of via e-mail, and even compensated us with a gift card to a restaurant for our inconvenience. We would gladly recommend this condo and definitely stay again. My wife and I stayed in this property over New Years this year. Upon our arrival, I was very impressed with how it presented. It was obvious that the owners take great pride in their property. The condo was in very good condition and was very clean with nice décor. It had pretty much everything you would need for a holiday stay. Just a few things to mention: All the plates, cutlery, glasses and coffee cup you would ever need, Coffee pot, small appliances, (blender, rice cooker) Ice maker in the fridge, odds and ends of kitchen supplies that had been left from previous travelers, Large bowls, BBQ utensils, Several items for the beach, (towels, chairs, umbrella, cooler), all were in very good condition. There was even dishwasher and washing machine pods for us to use. Not sure if those were left by the cleaning staff or from previous travellers. The AC was AMAZING!!! Especially at night. During our stay I did have a few questions for the owners. When I reached out to them, they were very quick to respond. The owners were a delight to deal with. Staff at the resort were also very helpful with questions I had about the property and grounds. The ground floor lanai was great with very comfortable furniture. My wife and I had coffee and breakfast everyday outside in the morning sun. 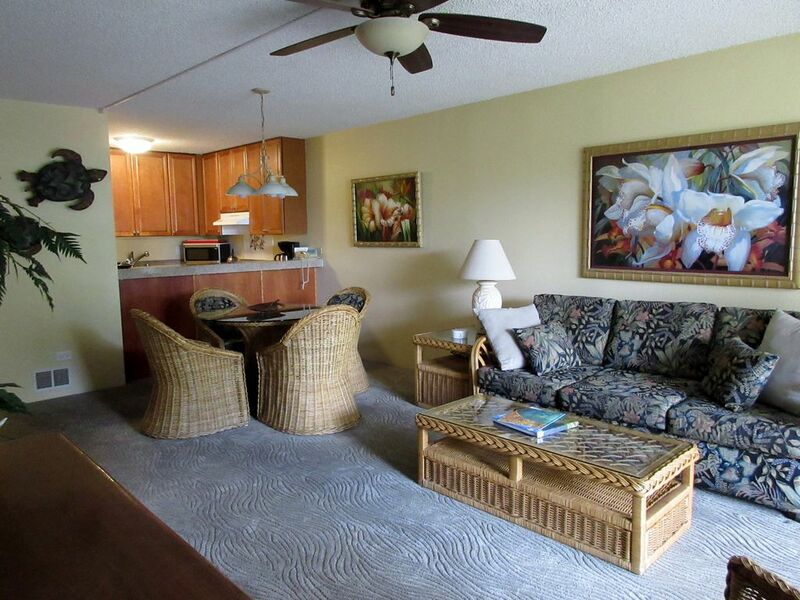 This condo is in a great location in Kihei. Kamaole Beach III is directly across the street from this resort (3 minute walk from the condo). This beach is great for families and little ones. Restaurants and shopping was very close by. The pool and hot tubs were great. The workout facility was very small an unequipped but that was very minor. The grounds to the facility were immaculate with several BBQ stations equipped with Webber BBQ's. The staff and locals who live there fulltime were very pleasant and friendly. In short, I would recommend this property anyone!! You will not regret choosing to stay at this property. My wife and I will definitely be back!! We had a delightful stay in this condo. The furniture and bed are very comfortable. It is well equipped with kitchen, linens and beach supplies. The air conditioners work very well and cover any outside noise. It is by the Bar-B-Q pit which is convenient for cooking but tends to get noisy after dark. The owners are very nice and respond quickly to any questions. The condo is as pictured and was neat and clean when we arrived. It is close to beaches and restaurants. The only issue was construction in the condo next door - not the owner's fault but did interfere with our last week. We would definitely return.